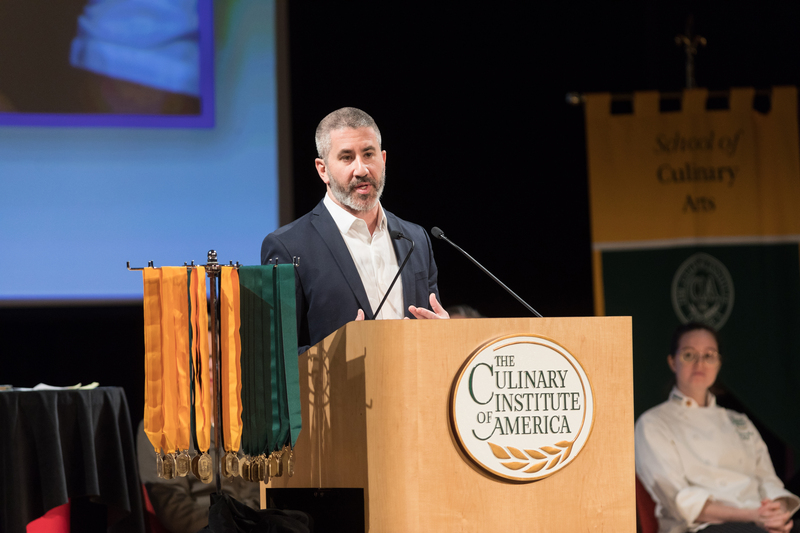 Hyde Park, NY – Michael Solomonov, executive chef and co-owner of Philadelphia’s acclaimed Zahav, was the keynote speaker during graduation ceremonies at the New York campus of The Culinary Institute of America on January 18. Chef Solomonov is known for his skill in transforming simple foods into culinary masterpieces. He won James Beard Foundation Awards for Outstanding Chef in 2017, Best Chef: Mid-Atlantic in 2011, and Book of the Year in 2016 for Zahav: A World of Israeli Cooking. Eater named him its National Chef of the Year in 2014. Solomonov opened Zahav—Hebrew for “gold”—with restaurateur Steven Cook in 2008. It quickly garnered rave reviews and honors, being named one of Esquire’s best new restaurants in America. Their company, CookNSolo Restaurant Partners, has a portfolio of concepts that includes Philadelphia restaurants Rooster Soup Company, Federal Donuts, Dizengoff, Abe Fisher, and Goldie. Dizengoff also has locations in New York City and Miami, and Federal Donuts has another location in Miami. Chef Solomonov, who has spoken publicly about the support he received while battling drug addiction, is known for giving back to his community. Rooster Soup Company donates all profits to programs providing the city’s homeless with meals, medical care, and legal help. The entire CIA commencement ceremony, including Chef Solomonov’s address to recipients of associate degrees in Culinary Arts and Baking & Pastry Arts, can be seen online.